Before converting a lead into a contact, it is important to briefly explain the terms lead and contact in CRM parlance. A lead is a potential potential, someone you have attracted and identified through your marketing campaigns or through other means. A contact, on the other hand, is usually someone who has already purchased from you, an existing customer so to speak. The process of converting a lead into a contact, account or deal is also known as lead conversion. Converting a lead into a contact is a process that may take some time, depending on how qualified a lead is. Granted, not all leads are going to be converted into contacts. However, it is of utmost importance that you get the best out of each and every lead. Once a lead makes a purchase from you, it stops being a lead; it becomes a contact. Or, rather, you have to convert it into a contact. Remember, a contact is someone who has done business with you, an existing customer, whereas a lead is someone who has just expressed interest in your product(s). With these two terms explained, let’s go through the steps of converting a lead into a contact. Here you can see all details about the lead such as the owner, first name, last name, phone number, email address, etc. 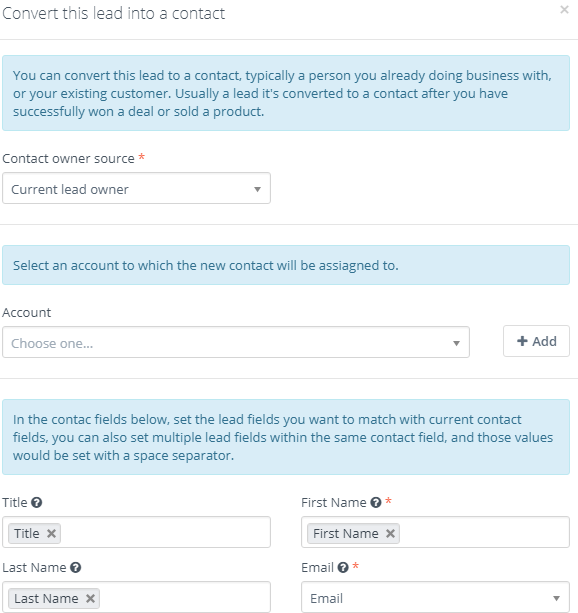 To convert the lead to a contact, click Convert. First, choose the source of the contact owner. It can be the current lead owner, a specific user, a random user from a specific group or no owner. Then, choose an account you want to assign the contact to. 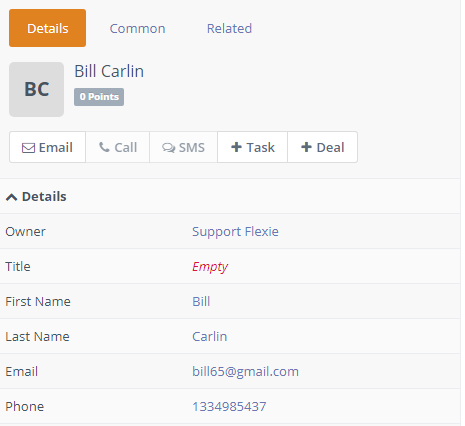 Next, map the leads fields with the contact fields such as first name, last name, email, phone number, etc. Once you make sure everything is correct, click the Save button, at the right-bottom corner of the form. Congratulations. You’ve just converted a lead into a contact.